Start a new Buick Grand National question. Did Buick make a GNX with T-Tops? Is There A Buick GN Mechanic In My Area? 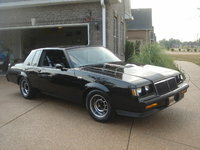 The first year Buick offered the Grand National was 1982. It was a two-tone dark grey and light grey paint scheme, and the turbocharged engine was an option very few of these cars were built with. The Grand National model was not offered in 1983. In 1984, the Grand National returned, this time in the all-black color scheme that's become its signature. Electronic fuel injection was offered for the first time with the turbo V6 engine. In 1986 and 1987, an intercooler was added to the engine package, which raised the output to a dramatically underrated 235 hp. This is the version on which the legend is based. For domestic U.S. production, the Grand National (and the non-black turbo Regal versions) was the fastest accelerating American car you could buy. Yes, faster than the Camaro, the Mustang, and the Corvette (although with modifications, all of those competitors could be made considerably faster). In addition to the Grand National, in 1987 Buick did a limited production run of 547 specially prepped Grand Nationals that were badged as the "GNX." 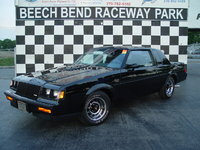 Due to its limited production numbers, the GNX became more of a collector's car, although the performance tweaks it received made it even faster than the standard Grand National. Contrary to popular conception, the GNX was originally built with a single turbocharger, despite what you might have heard about someone's buddy's uncle's best friend who had a twin-turbo GNX that had a bazillion horsepower, etc. I own a 1986 Regal T-type and a 1987 WE4. While neither of these cars should be called a Grand National, very few non-owners are aware that there were other turbo Regals. I'm sorry for not properly citing my sources, but perhaps someone else will submit supporting or disagreeing information? For further info, check out www.gnttype.org or visit www.turbobuicks.com.